There are 3 available types of pie pumpkins. The picture above shows a pie pumpkin compared to a jack. 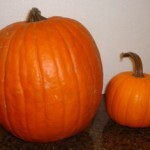 A pie pumpkin is much smaller in size, ranging from 2 lbs. – 7 lbs. They have a medium or dark orange color. They can be used for decorating, but are perfect for baking a pumpkin pie!